I am so happy to have this finish this week. But I can’t show it to you. Sorry. I know, so disappointing. I’m such a tease. It’s my first project tutorial for Moda Bakeshop, so I have to wait until it posts there before I can really share. 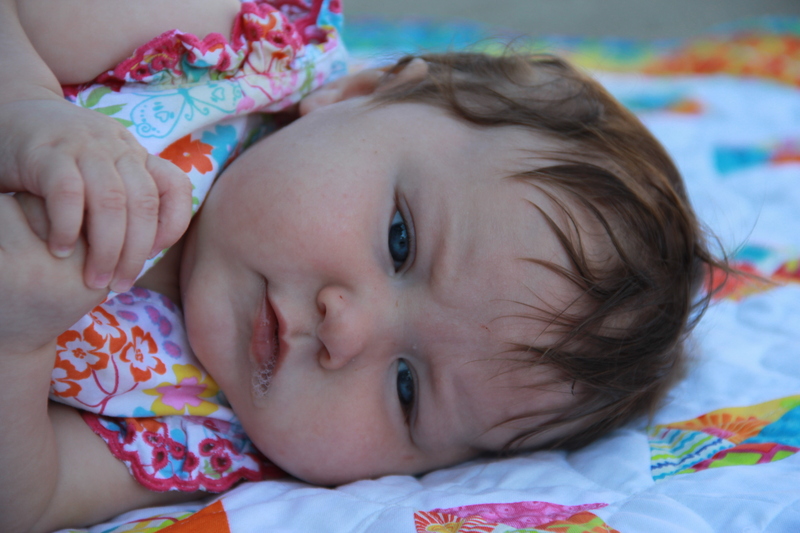 However, I will show this cute baby with a sneaky peek of the quilt. I’ll let you know when the tutorial is available so you can see the whole thing. Actually, I now have more than one shelf in the closest! My aspirations to have this space set up and ready to use were more ambitious than I anticipated. 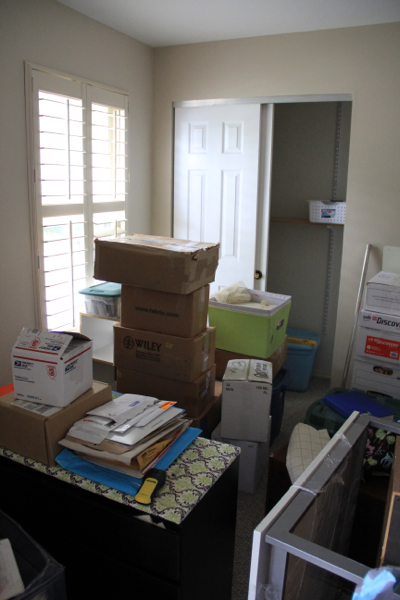 Turns out, it’s extra tough to move into a house and unpack while simultaneously going about the day-to-day task that come with living in a space! I hope to have more projects up and going soon. Meanwhile, I’m going to spend the next couple weeks getting this room in order bit by bit and I want you to clean up your space along with me. It’s a Sewing Room Clean-up Along! If today isn’t enough and you want more linky fun (you know you do), hop over to the Sewing Room Clean-Up Along post and show me your messy space. In two weeks, we’ll share our nice, neat space! Hope you have a space to get some sewing done! What have you finished this week? Great sneak peek (and what a cutie pie)! Can’t wait to see the tutorial on Moda Bakeshop! Congrats on the Moda Bakeshop post! Love that baby pic…. And the quilt looks sweet too! Cute baby! Good luck with the unpacking and settling in! I completely understand your ambitions (and frustrations) of wanting to get your sewing room set up after just moving. I just went through the same thing last month moving from Ohio to Florida. I even just posted an update last week on the progress of my studio. Best of luck to you and I hope you’re back to sewing in no time!